Wrinkle Brig, 16 foot gaff rigged cruiser. A production boat with quite a few built. Arrandir - Youtube , Video of a 14 foot ocean cruising boat. The voyage of Acrohc , Around the world in a 12 foot boat. Microcruising in the Bahamas , Several unique pocket yachts, all extensively cruised. Also check out the famous small boats page. Paradox Johanna , A paradox pocket yacht site. Paradox Zoe , Another great paradox site. Tinkerbelle , Ebook. If you haven't read this you haven't lived! Tinkerbelle Revised , Plans for sale for a small boat based on Tinkerbelle. Famous Small Boats , A great list of tiny boats that have done big voyages. Lots of Links! Sea Biscuit , can an eight foot boat sail around the world? 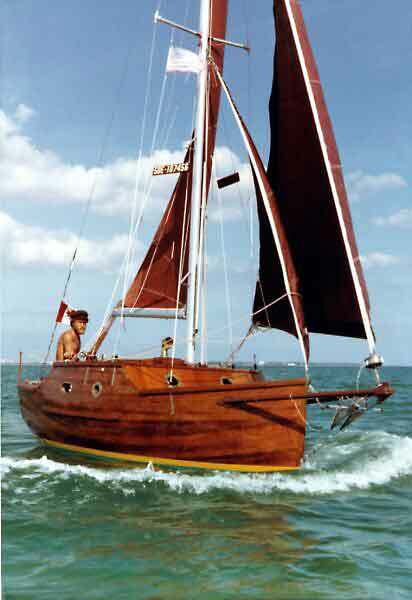 Dodo , A 4.6m cruiser, designed to be easy to build. Duckworks design contest entry. Pdracer , Ways to make your pdracer have a cabin. Ocean Explorer , A small cruiser based on the ozracer hull shape, (which is based on the pdracer hull shape). An eight foot, square cruiser. And vids on youtube! Sleeper , I quite like the idea of this boat. Simple and effective! Guppy and Sparrow Sailboat info page , Lots of good stuff here! Around in ten , Check out the gallery! Cruiser Happy , Wow… see pic here. Swaggie Uruguay , A bigger small boat See this page for a real small one. Adelie 14 , Plans for sale from Bateau. Adelie 16 , The bigger sister of the Adelie 16. Fafnir , A John Welsford design. Pocket Cruisers up to 16' , Plans for sale from Selway Fisher, very nice! Arrandir video, youtube , A 14 footer used to cross oceans! Tardis , A cool little cabin boat. More pics at the eastern messabout yahoo group. Minuet Yachts , Very small keelboat one design racing class. Mini square rigged , The smallest tall ships I've ever seen! The really small yacht site , The bestlooking small boats ever to be made! Little Leon , A 16 foot scale replica of a brigantine. Sailing Midget Ships , Pages from an old magazine.